Here at LoyalShops we are going to start delivering LoyalShops Tips for our LoyalShops customers. This productivity tip was inspired by Lularoe Jaime Chapin, @lularoejaimechapin. She’s awesome and has amazing ideas, check her out! Have a great tip your willing to share? Let us know at support@LoyalShops.com and we can highlight you as well! We hope you enjoy these tips as much as we do. 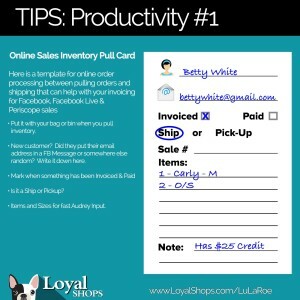 For the first one, we are posting an Online Sales Inventory Pull Card. This is a template you can print out for your pick-pack-invoicing and shipping for Facebook, Facebook Live and Periscope sales. Put it with your bag or bin of pulled customer inventory. Have a new customer? Did they put their email address in some random location, write it down here so when you get to the invoicing stage you aren’t hunting it down again. Mark the customers choices as Invoiced / Paid. Is it a Pickup or going to be Shipped? What Items? How many? What sizes? Makes for faster Audrey Invoicing to write these down as you pull them. Don’t look at them a second time! Don’t just buy the minimum order, just stepping up from 9 pads of 50 to 18 pads of 50 goes from $3.82 per pad to $2.26 per pad. And if you really love these, going to 36 Pads of 50 costs twice as much for the order, but you get 4X the pads! If you have ideas to improve this further, please list them here. If we see some cool adjustments, i’ll spin it and put out a new version.